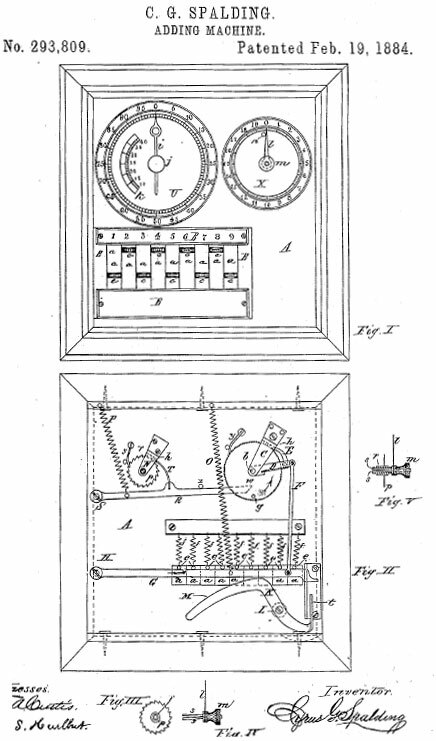 Cyrus G. Spalding of Boston, Massachusetts, was a holder of two US patents for adding machines: №146407 from January, 13th, 1874 and №293809 from February 19th, 1884. The second patent of Spalding (see the lower patent drawing) is for a device (an improved version of the first patent's device), which had an additional wheel for hundreds. 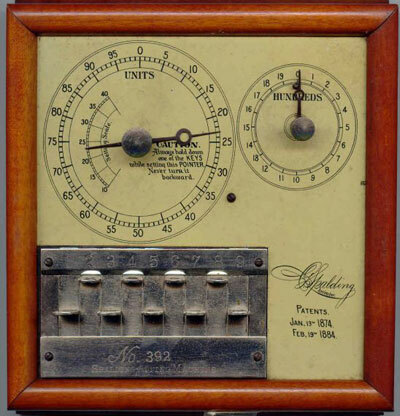 The machine is nested in a beautiful wooden case with dimensions: 7 1/8" by 7 1/4" by 1 1/2". It has a clock hand for units, co-operating with a dial graduated from to 99, showing the figures 5, 10, 15, etc., to 95, for every five graduations. Another similar hand or arrow and dial to register the hundreds is also provided, having a capacity to register nineteen hundred. Attached to the arrows, through a shaft connection at the back of the casing are ratchet wheels, having respectively the same number of teeth as the graduation of the dial to which each hand belongs. Cooperating with the hundred-tooth ratchet of the units and tens register hand is a ratchet and lever motion device to turn the arrow from one to nine points of the graduation of the dial. The ratchet and lever-motion device consists of the spring-pressed pawl E, mounted on the lever arm D, engaging the hundred-tooth ratchet, the link or push-rod F, the lever G, and its spring O. A downward action of the lever G, will, through the rod F, cause a like downward action of the lever D, causing the ratchet pawl E to be drawn over the ratchet teeth. Upon the release of the lever G, the spring O, will return it to its normal position and through the named connecting parts, ratchet forward the arrow. The normal position of the pawl E is jammed into the tooth of the ratchet and against the bracket C, that forms the pivot support for the pivot shaft of the arrow. This jammed or locked combination serves to stop the momentum of the ratchet wheel at the end of the ratcheting action, and holds the wheel and its arrow normally locked until the lever G is again depressed. The means for gauging the depression and additive degrees of action of the lever G is produced through the slides or keys marked a, having finger-pieces c, springs f, and pins e, bearing against the top of the lever G, combined with what may be called a compensating lever marked K.
The specification of the patent states that the depression of a key will depress the lever G and the free end will engage the bent end t, of the compensating lever K, and rock its involute curved arm M, upward until it engages the pin e of the key, which will block further motion of the parts. The carry of the hundreds is accomplished by means of one-step ratchet device represented by the parts lever R, pawl T, spring P, and operating pin g. When the hundred-tooth ratchet nears the end of its revolution, the pin g, made fast therein, engages the free end of the ratchet lever R, and depresses it; and as the hand attached to the hundred-tooth ratchet wheel passes from 99 to the 0. The operation of the device can be seen in the lower instruction of the machine. 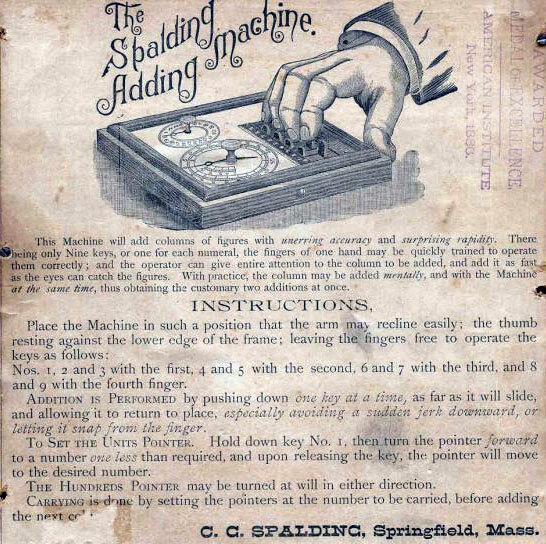 It seems several hundred Spalding adding machines were produced and sold, but only some 8 known to exist now. Not a whole lot is known of the inventor—Cyrus G. Spalding. Cyrus Grant Spalding was born on September 26, 1835, in Waltham, Massachusetts, a son of Cyrus Spalding (1802-1880), a blacksmith born in Hillsboro, New Hampshire, and Susan Straw Grant (1807-1895) from Lyman, Maine. Cyrus married to Emily Clark Swart, daughter of the blacksmith David Swart (1814-1891) and Mehitable C. Clark (1815-1880), on December 15, 1859, in Chicopee, Hampden county, Massachusetts. (Emily Clark Swart was born on March 1838 in Pittsfield, Massachusetts.) On October 6, 1860, was born their first daughter, Susan Emily, and in 1867 the second daughter, Mary. In the middle 1860s Cyrus took part in the Civil War, then returned in Chicopee, where by 1870 he worked as a book keeper. Cyrus then moved to Boston and Springfield, MA, where he lived until his death after 1910.